arriving a park about 3 p.m. same day. 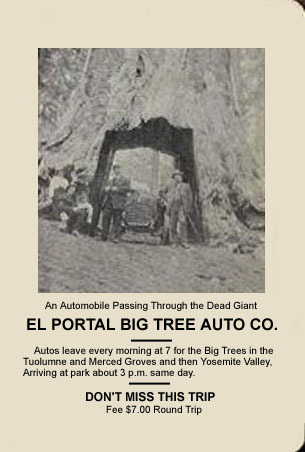 AUTO stages of this line leave El Portal every morning for these wonder ful groves arriving in the Yosemite early in the Afternoon. They will leave Yosemite either in the morning or afternoon, according to circumstances. Mr. E. R. Penfield is General Passenger Agent here and he will give you fuller particulars. The Big Giant Trees and Sierran Forests Invite You. It will cost you only $7.50 and less than a day of your too short time.